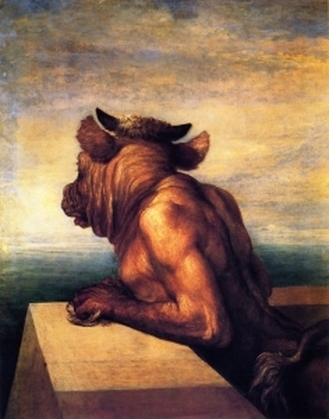 The Minotaur is one of the most famous, and most recognisable, monsters from Greek mythology; and of course, the Minotaur, was the beast that the hero Theseus had to overcome. The story of the Minotaur in Greek mythology begins on the island of Crete, during the reign of King Minos, the son of Zeus and Europa. To justify his assertion that he should be king of Crete, upon the death of his stepfather Asterion, Minos prayed to the Greek god Poseidon for a sign that the gods were favouring him. Poseidon responded to the prayer by sending forth a magnificent white bull from the sea, a beast that would be known as the Cretan Bull. The expectation was that having become King of Crete, Minos would sacrifice the Cretan Bull to Poseidon, for his show of favour. King Minos though was so taken by the magnificence of the bull that the king decided to sacrifice an inferior bull in its place. Minos obviously felt that Poseidon either would not notice the substitution, or else would not care about it. Poseidon though did notice the sacrifice of the inferior beast, and was very much affronted by the actions of King Minos. Poseidon though did not directly punish King Minos for his actions, but instead had his revenge in a strange way. Poseidon would transpose the love of the bull that King Minos obviously had onto his wife, Queen Pasiphae; but the transposed love manifested itself in a physical way, and Pasiphae was said to have lusted after the bull. Pasiphae was herself a sorceress but she couldn’t counteract the will of a strong god like Poseidon, but to give into her unnatural lust, Queen Pasiphae would have to employ the master-craftsman Daedalus. Daedalus would craft a lifelike, hollow cow from wood, into which Pasiphae would climb. The wooden cow was then taken out into the field where the Cretan Bull was enclosed. The Cretan Bull would mount the wooden cow, with Queen Pasiphae inside, and would make Pasiphae pregnant with child. After the expected time, Queen Pasiphae would give birth to a child, but a deformed child being half-man and half-bull, a child that would ultimately be best known by the name Minotaur. At his birth the Minotaur was named Asterion, a name that can be translated as the “starry one”, and a name that was also given to the King of Crete who preceded Minos. As a baby, Asterion was treated as a normal child, and was suckled by his mother, and as he grew up he was free to run around the palace of King Minos. As Asterion grew up, he grew more savage, and the bull like characteristics of Asterion grew more pronounced, and he would terrify visitors to the palace. It was at this time that Asterion became known as the Minotaur, or Minotaurus, a name that means “Bull of Minos”. Eventually it was no longer safe for the Minotaur to roam freely around the palace, and so King Minos sought out the advice of the Oracle of Delphi about what to do with his stepson. The priestess advised Minos that he must make use of Daedalus, for the craftsman was to create a gigantic labyrinth to enclose the Minotaur. The Labyrinth of Knossos, beneath King Minos's palace, was the most complex maze ever designed and built, with passages crossing over one another, with no obvious start or finish to it. Even Daedalus, having built it, would find it difficult to exit his own creation. The Labyrinth of the Minotaur would become a prison for Asterion, and he would be fed through hatches in the ceiling of the maze; with part of his diet made up in the form of human sacrifices. At this time, Crete and Athens were in dispute, after Androgeus, the son of King Minos, had been killed whilst a guest of Athens; and with the military force of Crete superior to that of Athens, Athens was forced to pay tribute to Crete. The form of the tribute was in people, for seven young men and seven maidens from Athens would be sent to Crete. Some say that this was a yearly tribute, whilst others say it occurred every seven or nine years. Upon arrival on Crete the 14 Athenians would be thrust into the labyrinth where they would be hunted, and ultimately devoured by the Minotaur. Time would pass, but then a batch of 14 Athenians arrived with Theseus, the newly recognised son of the King of Athens, amongst their number. 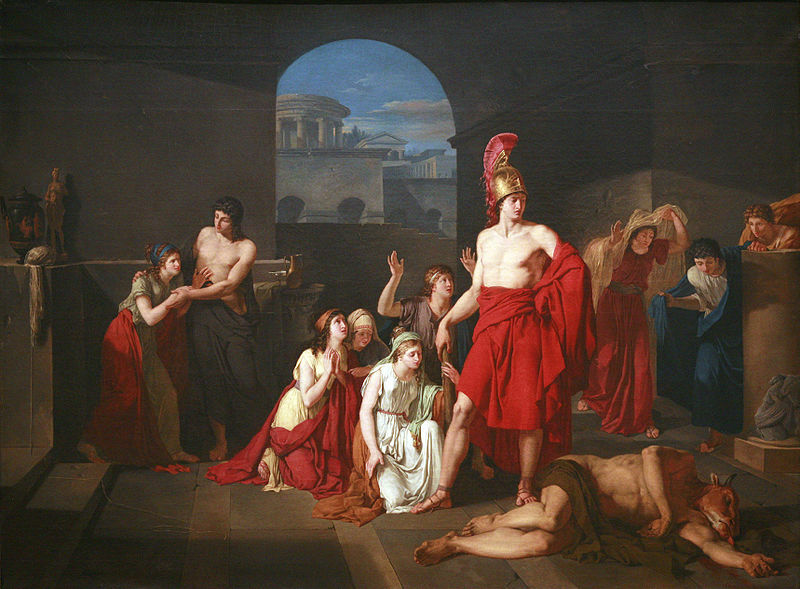 Theseus had decided that he could end the subservience of Athens by travelling to Crete. When Theseus and the other Athenians arrived on Crete, he was espied by Ariadne, the beautiful daughter of King Minos. It was love at first sight for Ariadne, and she decided to help Theseus, so that he would not be killed by the Minotaur. Ariadne surreptitiously gave to Theseus a sword so that he would not be unarmed within the labyrinth; Ariadne also asked Daedalus how Theseus might safely navigate the maze, and Daedalus told her that Theseus must carry with him a ball of thread so that his movements could be retraced. Armed with sword and thread, Theseus would enter the domain of the Minotaur, and having tied one end of the thread to his entrance point, would set out to hunt down the Minotaur. Luckily, Theseus actually came across the Minotaur whilst it was asleep, and with one thrust of Ariadne’s sword, Theseus killed the Minotaur. In an early adventure, Theseus had also killed the father of the Minotaur, the Cretan Bull, who at the time had been ravaging the countryside of Marathon. Theseus would exit the labyrinth the way that he had entered, and even managed to rescue the other surviving Athenians who were lost in the maze. Theseus, his fellow Athenians, and Ariadne, quickly left Crete on the very boat that had brought them to the Greek island. King Minos would take out his anger upon Daedalus the man who had assisted Theseus in killing the Minotaur; and so Daedalus was locked up in a tower. Daedalus would ultimately escaping by flying to his freedom, and Minos would die in his attempt to recapture the craftsman. Theseus and Ariadne did not live happily together though after the death of the Minotaur, for Ariadne was abandoned on the return journey, although she would become the immortal wife of the god Dionysus.